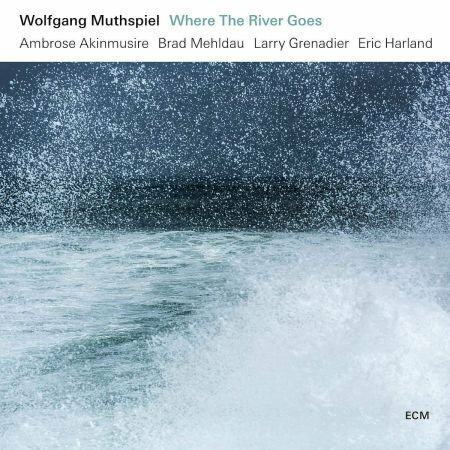 Where The River Goes carries the story forward from Wolfgang Muthspiel's highly-acclaimed Rising Grace recording of 2016, reuniting the Austrian guitarist with Brad Mehldau, Ambrose Akinmusire and Larry Grenadier, heavy talents all, and bringing in the great Eric Harland on drums. Much more than an "all-star" gathering, the group plays as an ensemble with its own distinct identity, evident both in the interpretation of Muthspiel's pieces and in the collective playing. The album, recorded at Studios La Buissonne in February 2018, and produced by Manfred Eicher, features six compositions by Wolfgang Muthspiel and one by Brad Mehldau, plus group improvisation. It is issued in both CD and vinyl formats. Wolfgang Muthspiel plays music from Where The River Goes on tour this autumn with concerts at major venues in Germany, Belgium, Austria, Switzerland and Estonia.